Convert PDF to Word (DOC and DOCX). Convert PDF to Rich Text Format (RTF). Retain Original Layout and Styles. You can use VeryPDF PDF to Word Converter to convert PDF files to editable Word documents in batches. This tool provides a lot of reconstruction modes, enabling you to generate Word documents with text and images, text only, text without text boxes, etc. 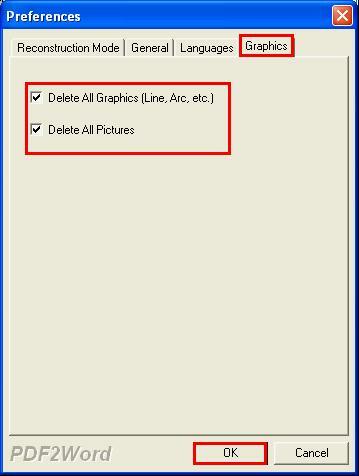 Please follow the steps below to create Word from PDF. Please double click the icon of VeryPDF PDF to Word Converter on the desktop to open the main interface of this program. To input the PDF files you want to convert, you can drag the PDF files you want to convert from Windows Explorer into the main interface as illustrated above; or click File at the upper left corner of the interface, > click Open in the list that appears to open the Open PDF File dialog box, > select the PDF files you want to convert and then click Open. After the selected PDF files are input, the Preferences dialog box pops out. You can select reconstruction mode and other options in this dialog box. For example, if you want to create text-only Word from PDF, you can do as follows: click the Graphics tab, > click in the check boxes before Delete All Graphics and Delete All Pictures, > and then click OK. The Save As dialog box will pop out immediately. Please select a folder to export the result Word documents into, and then click Save. The computer will immediately process the files. After the conversion is completed, the output files will be opened automatically.